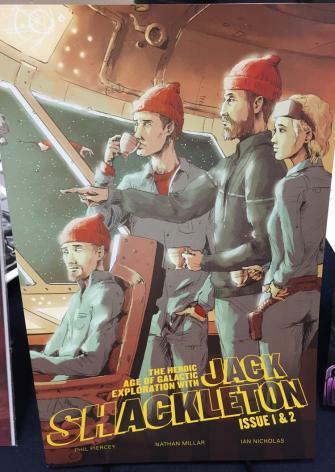 Jack Shackleton is part Star Trek and part The Life Aquatic By Steve Zissou. For Star Trek, we’re talking original series here: the classic stuff. It’s a story of a son trying to find his father. The father was lost in a ship called Calypso that was lost while trying to go through an aberration in space. Jack has assembled a new team to search for his father and film new worlds they come across. In another parallel with Kirk and Company, the cameramen that accompany Jack tend to come to rather poor ends. It’s funny that the deaths of these characters are given the same amount of irrelevance to the main team as was done in the classic TV show. It’s always hard to be critical about independent books in so much as they get to do whatever they want for reasons. Shackleton is quite easy to like. The book I ready read for the review is a combination of the first two issues. And you can tell that this creative team is getting comfortable with their new characters. The first part of the book has dialog that was a little stilted. As it went on into what becomes the second book, the interactions became much more relaxed and natural. The art is all about the red toques. It appears that Nathan wanted to say to the world: I can draw the best red toques darn it! The book looks great and the full page art is stunning. That includes the cover and the preview of the next book. A good artist knows how to let the dialog breathe, and there plenty of awe to take in here. There looks to be a ton of care and attention taken to portray the story the best way possible. Did I say that #3 is out now? Watch out for Ian and Nathan at signings around Calgary and at the major comic events with their Panel One brethren. As far as this book goes, it’s a fun joyride that will leave you wanting for more.